Those days when it hasn’t rained, it’s been so hot and humid, Calvin starts panting the second his paws step outside onto the covered porch. I’m not complaining. It’s summer after all. Okay, I’m definitely complaining. Because it’s supposed to be summer. I waited a wet and blizzard-filled winter for some warm, bright, breezy summer days. Where are they, please? I’ll end my sob story there. 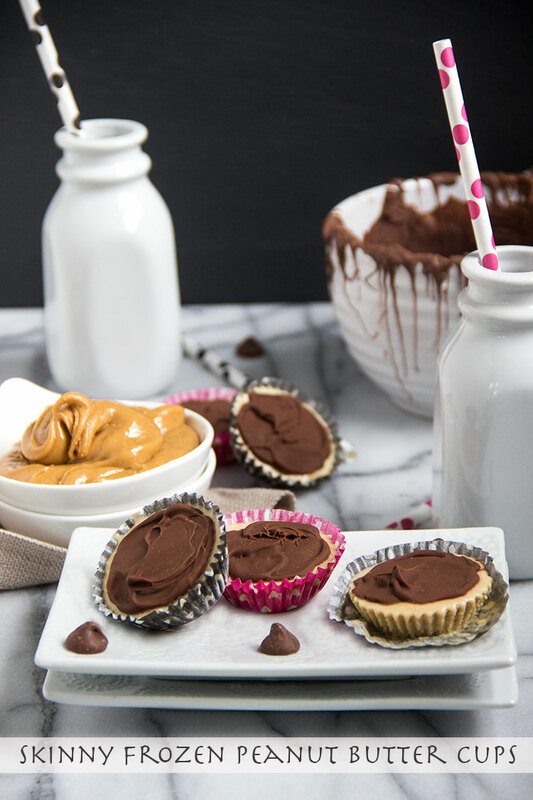 And move along to something that’s brightened my summer recently: homemade frozen peanut butter cups! These sweet little bites contain some of the things I love most in the world. And a generous helping of creamy peanut butter. 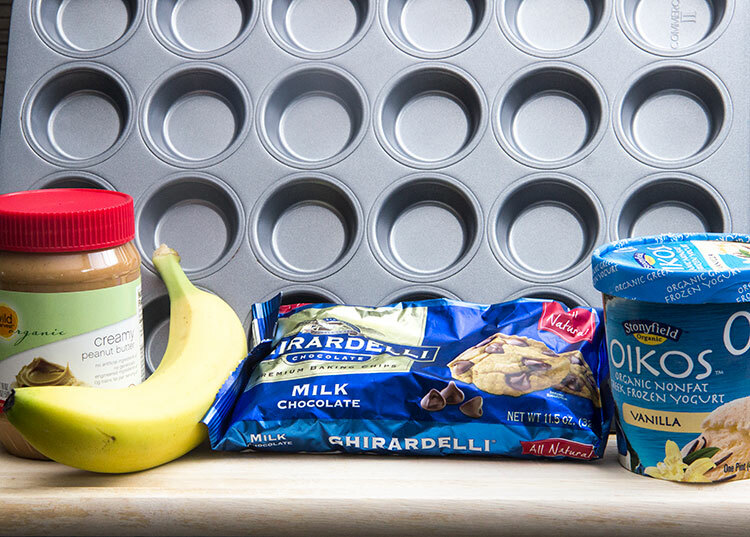 Made with healthy ingredients like bananas and frozen yogurt, they’re just the thing for satisfying a sweet craving for about 75 calories a pop. They’re also super simple and foolproof, with just four ingredients. Here’s everything you need to get started. Easy, right? Begin by tossing half a banana, some low-fat vanilla frozen yogurt, and a good helping of peanut butter into a blender or food processor. 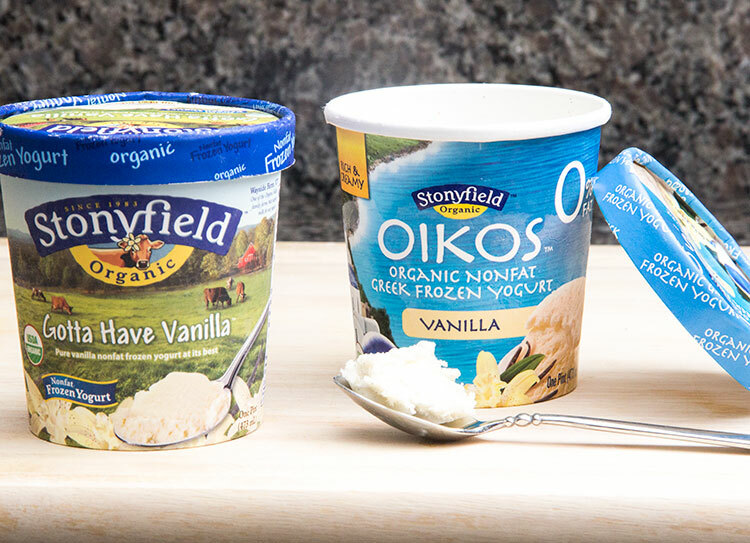 Even Healthier: If you can find Greek frozen yogurt, even better! 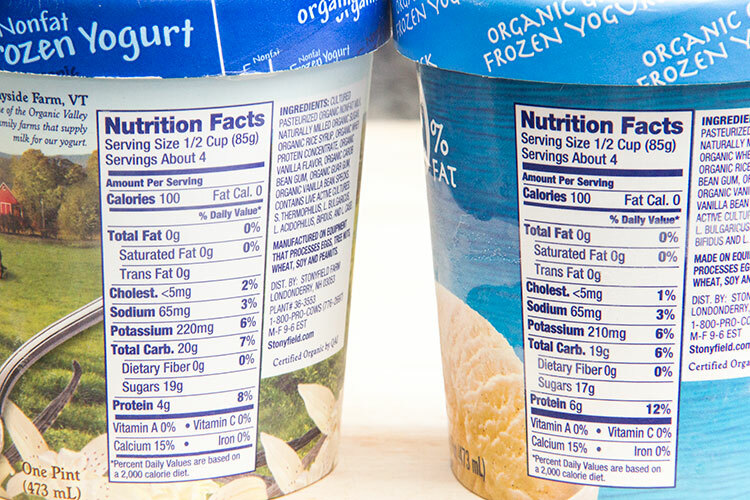 I compared the nutrition labels, and both are quite healthy, as far as desserts go. But Greek frozen yogurt has a little more protein (to keep you feeling fuller for longer) and a little less sugar. Puree the mixture until you have a smooth, creamy liquid. Use a spoon to scrape all along the sides and bottom of the container and stir. The majority of the peanut butter likes to cling to the sides, and you don’t want to miss one drop of that deliciousness. Then grab some mini cupcake liners (the kind I used for this recipe are about 2 inches across the top) and a small spoon to fill them very nearly to the brim. Then place them in the freezer to solidify, which takes about an hour. When the peanut butter cups are nicely frozen, grab a handful of milk chocolate chips. Place them in a heat-safe bowl and microwave for about 40 seconds, then stir. If the chips don’t melt completely after stirring, pop back in the microwave for another 20 seconds, then stir again. 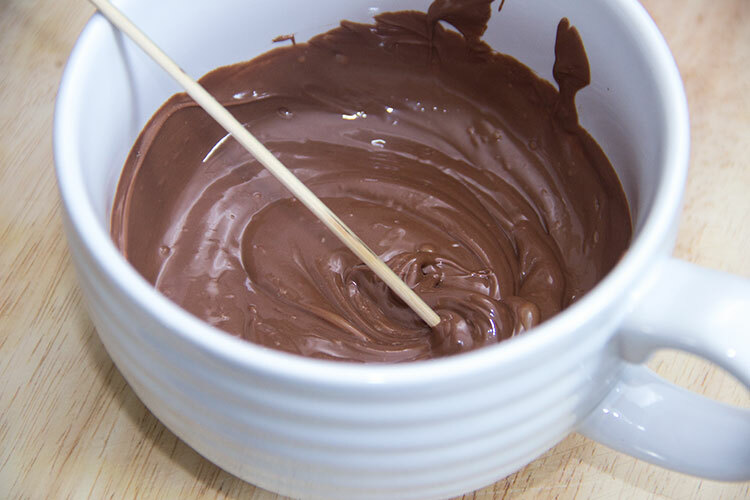 Repeat this process until the chocolate is just melted. Even Healthier: if you really love dark chocolate, use a dark chocolate bar in place of the milk chocolate chips. Dark chocolate full of flavonoids (antioxidants) that prevent cell damage and improve blood sugar levels. Next, cover the peanut butter cups in chocolate. I work in batches so the cups don’t melt while I’m working. Take two out of the freezer and use a dinner knife to spread about a teaspoon of chocolate over each one. Then put them back into the freezer and grab two more. Continue with this process until all the cups are chocolate-covered. The cups may need to sit in the freezer another 20 minutes or so to re-solidify. Then they’re ready to enjoy. The only thing better than peanut butter, in my mind, is creamy frozen peanut butter that is covered in milk chocolate. But I also love that this treat is lower in calories, fat, and sugar as compared to the packaged and processed kind. Such a sweet, creamy, rich treat – made with just four simple ingredients. 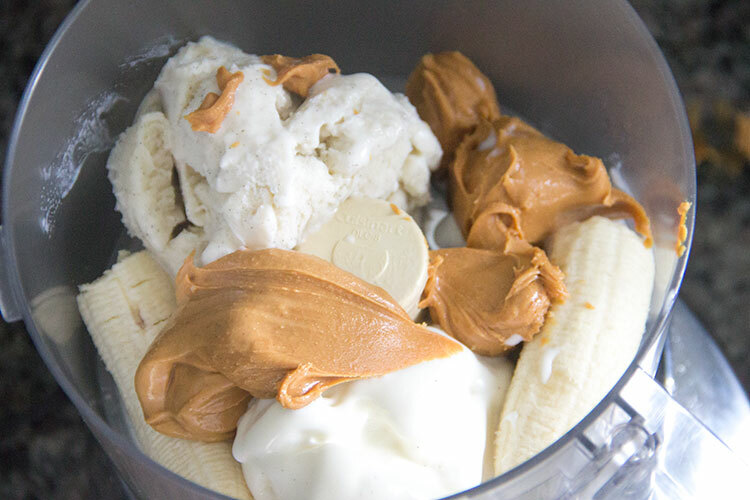 In a blender or food processor, puree the banana, frozen yogurt, and peanut butter until a smooth and creamy liquid is formed. 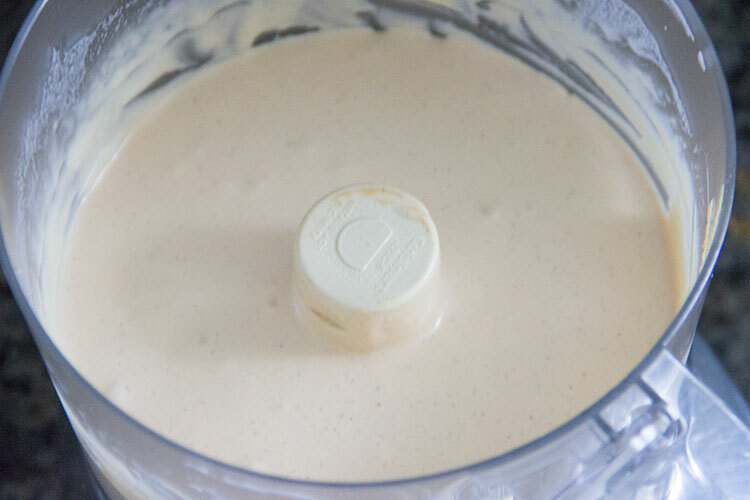 Use a spoon to scrape along the bottom and sides of the container and stir, ensuring that all of the peanut butter and frozen yogurt are fully incorporated. Puree again. 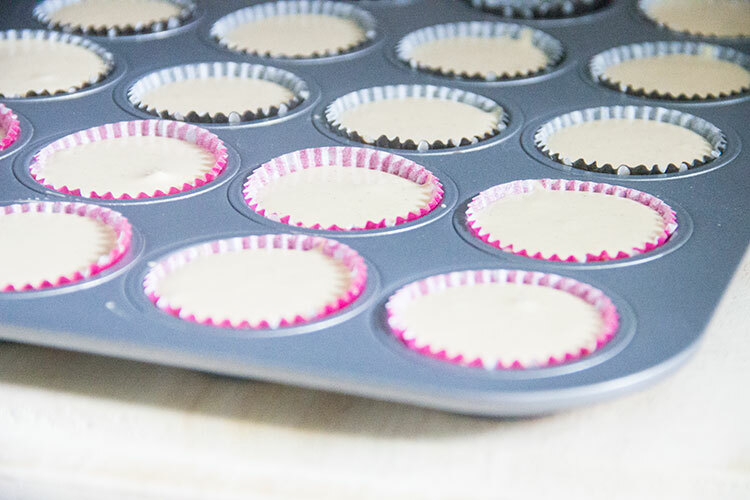 Arrange 12 mini cupcake liners in a mini muffin pan. Use a small spoon to transfer mixture to mini cupcake liners, filling nearly to the brim. Place pan in the freezer until peanut butter cups are frozen solid, about 1 hour. Place chocolate chips in a heat safe bowl and microwave for about 40 seconds. Stir and if chips are not fully melted, place back in microwave for 20 seconds more. Repeat until chocolate is just melted. Remove two frozen peanut butter cups from the freezer and use a knife to spread melted chocolate all over the tops. Place the chocolate-covered cups back in the freezer and remove two more. Repeat this process until all peanut butter cups are covered in chocolate (this process keeps the peanut butter cups from melting). Allow the peanut butter cups to freeze and re-solidify, about 20 minutes. Storage: store peanut butter cups in an airtight container in the freezer. GAH! 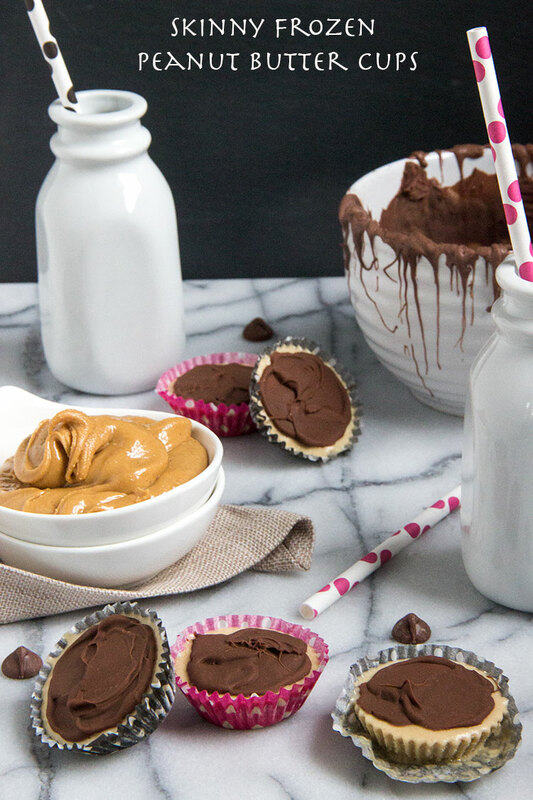 I love peanut butter and these frozen cups look addicting! I love that they’re lightened up and I can make a big batch and have them around for a while…as if they’d last more than 24 hours… 😉 Have a great weekend! Oh my goodness, what a fabulous idea! I love everything about these sweet little treats! Jen, just love when you provide me with calories … to be honest I don’t dare to do this recipe – because I would eat them all in less than a day. We do something every likeness to this for our traditional Christmas sweet-table, but they are not frozen as such .. even if we called them iced. I would love to do this in bigger size and for dessert … with some fresh fruit coulis. Will let you know. Forgotten to tell you that your photos are so inviting and tempting … especially the main one and the one of the food blender. This looks incredible! Do you think I could make them in a standard cupcake tin and simply make six instead of twelve? These look awesome!! Love the combo of banana and peanut butter with the frozen yogurt, and your composition and lighting are gorrrrgeous! How in the world can you even wait 20 minutes to solidify?!?!?!? I would be SO eating them as I made them! LOL! Oh my gosh, these look so professional and delicious! 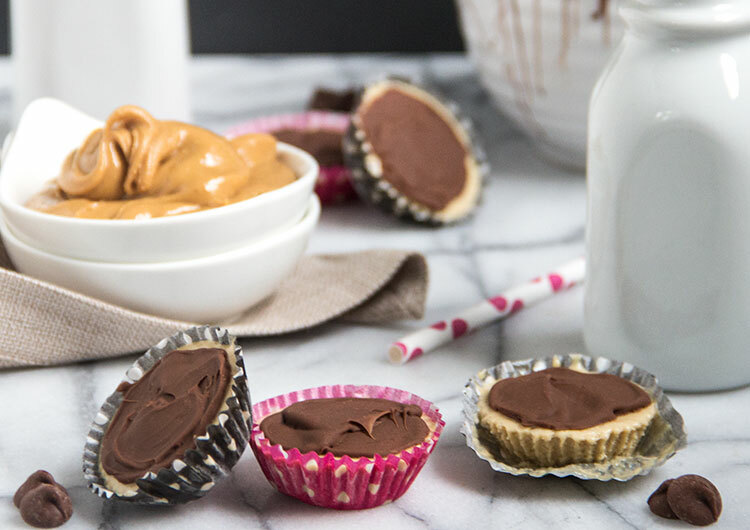 Yes please to a skinny chocolate & PB indulgence! These sound incredible! What a great summer dessert! These are soooo tempting me right now!!! Cool recipe and loved that it literally took minutes to prepare. What is your opinion on using plain non-fat greek yogurt as a substitute here? I’m assuming some sugar may need to be added but overall, do you imagine the result as far as consistency, etc would be the same, if not similar? I can’t wait to try this one out! Thanks for sharing it! I found that if you put a M&M in the middle of every cup it makes look really pretty and makes it taste extra good. and what I did about the yogurt is I put in some homade yogurt and added vanilla and maple syrup and OMG it was so good!